This is my second entry for the 2 Sketches 4 You 1st Annual Ultimate Card Showdown. 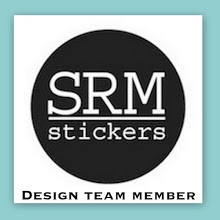 If you haven’t ever tried one of their sketches, now is definitely the time to do so because at the end of the month, they are going to be giving away an amazing prize package worth over $500. 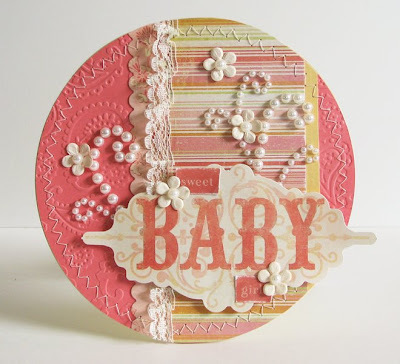 I decided to use the wonderful sketch by Laura on a circle card for a baby girl. Other: Cuttlebug and embossing folder, lace, sewing machine and thread. Love the pearl accents..!! so cute..!! Gorgeous card. You did a wonderful job! Your entries for the Showdown are AWESOME! To my eyes, you are the winner!!!!!! I am pulling for you, my Friend! What a precious card Amy! Thanks for playing at 2S4Y! Beautiful stunning, amazing you want more,,,,,,,don't know what to say, I love this take on the sketch! Wow, you did a great job again. I like this one even more! OMG this is so beautiful loved the first one but this is even lovelier. You did a great job. This one is lovely too! WOW! This is just incredibly beautiful! I love all the little details. Those pearl swirls are fab! Oooh! This is just adorable! Love that you made a round card with the sketch. Great job! I would never have thought to turn the sketch into a circle...great idea, beautiful card! Incredibly beautiful! I'm loving all those pearls and lace - how perfect for a sweet little baby girl!! This card is amazingly beautiful, Amy! You did a great job! It's perfect for a baby girl. I left a little something for you on my blog, go check it out! OMG! such a beautiful card! Wow! 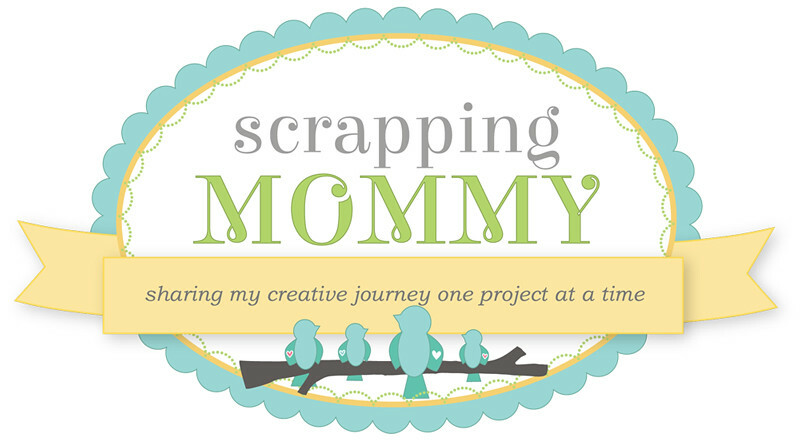 Just stopped by to thank you for linking to my blog candy and seen how amazing your cards are! This is just gorgeous! Fingers crossed and good luck for the draw! This is really very sweet! 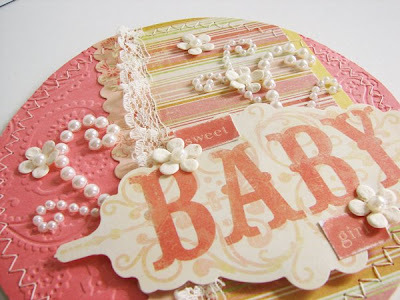 The pearls work so well on the embossed background! How adorable Amy! This is fantastic. Love the colors. I love the circluar version of the sketch. This is gorgeous. Congrats on making the Top 30! I think you deserce it! Congrats on making the 30! I wil keep my fingers crossed for you! Just wanted to stop by again and say CONGRATULATIONS on making the TOP 30!! Beautiful card! I just love the circle shape, the pretty colors, the pearls... TFS! Congrats on making the top 30! CONGRATS ON THE TOP 30!!!! Beautiful card! THis is just super pretty!! COngratulations on making the Top 30!! HUGE Congrats on making the Top 30, this is a gorgeous card!!! This is stunning!! Those pearls are out of this world amazing! Congrats on making the Top 30 finalists! Oh my goodness!! This is such a beautiful card! 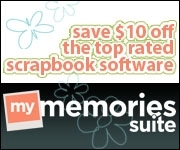 Thank you for linking my blog candy! WOW...what a gorgeous card!!! Congrats on making the top 30! Holy moly this is the cutest card ever! Congrats on making the Top 30!! Congrats on making the top30 and good luck for the next round. This card is my favorite card of the challenge ! Your card is just beautiful, congrats on making the top 30!!! Congrats on making the Top 30, Amy! Your card is absolutely gorgeous!!! Congrats! Love the shaped card - it's one of a kind! Yay hooray! I was so excited when I saw you were in the top 30 -- I knew as soon as I saw "Amy" at the top of the list that it had to be you. Congrats! Have just come across this card whilst looking at circle card ideas. It is truly beautiful. Thanks for visiting my blog Amy and answering my question about balancing your card.